14 x 8 Stamped Steel Return Air Grille - Plated Pewter Discounts Apply ! 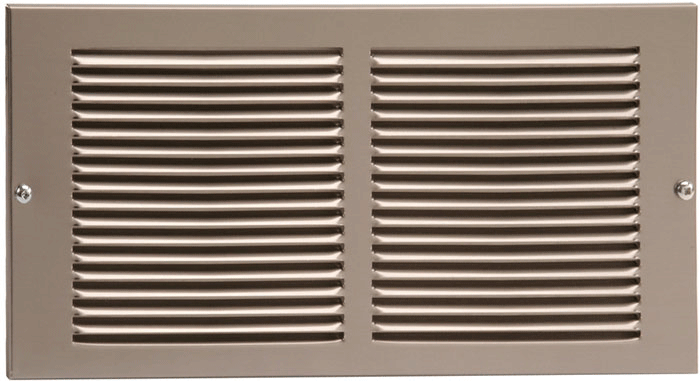 Use this pewter return air vent to replace your old plain return grilles. These pewter return air vents have a beautiful and durable plated finish. These return air grilles are not only decorative, they are also sturdy. Pewter return air vents have a solid steel core and a single piece construction that make them strong. Return grilles are also a snap to install; they come with predrilled holes and screws. The pewter return air vent will fit over a 14 x 8 hole. The return grilles have the standard 20 degree slanted fins that are spaced 1/3" apart, and a 3/16" margin turnback. Pewter return air covers do not have a damper and therefore allow for uninterrupted airflow. These return vents can be used on the wall or ceiling. ***Hint: Pewter return vents are only for use on ceiling or wall. They are not intended for use on floors. The industry standard is to measure the hole size to find the correct dimensions for your return grilles. This return air vent will fit over a 14 x 8 hole. The faceplate dimensions are 15 1/4 inches x 9 1/4 inches. Looking for return grilles in brass, white plastic, or white steel? Matching baseboard pewter return air vents are also available. Buy this pewter return air vent for any project where you need a little excitement!